The house is quite now after a wonderful visit with Laura, Cheryl and Zachary. 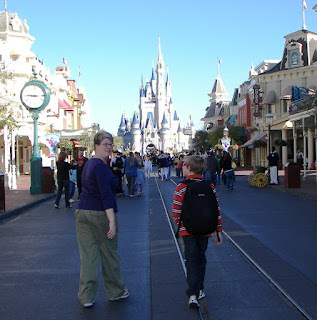 Seven years ago I promised to take Zachary to Walt Disney World and I finally kept my promise. 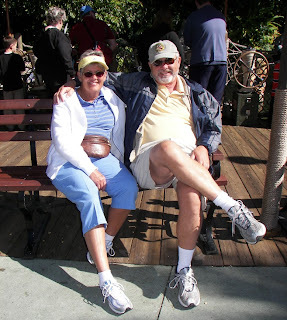 We spent two nights at Shades of Green at Disney and the entire day Friday was devoted to the Magic Kingdom. When you first walk into the Park - with the castle ahead - you already know you are in for a special treat. We headed to Tomorrow Land and Space Mountain to begin our adventure. Yes, I rode it and, yes, it was a hoot!! 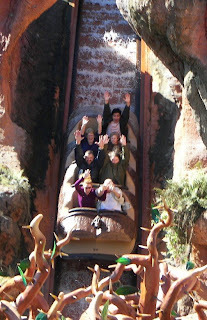 Look closely and you will see Laura and Zachary on the Flume. Bill took this shot. Since they come down so fast, he took pictures of every boat until he got the right one - so if you were on the Flume on Friday - we probably have your picture! 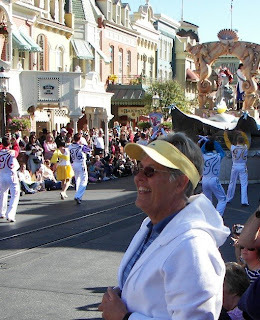 Mid-afternoon we secured our spot on Main Street to watch the parade. While at Disney, every second is designed to keep you engaged. Sometimes you have to wait in lines for the rides - but there is so much to see and hear going from room to room, it goes quickly. While we were waiting for the parade to begin, Disney people invited the children to join them on Main Street and they played games. There was no time for any age to get bored or antsy. They have thought of everything! 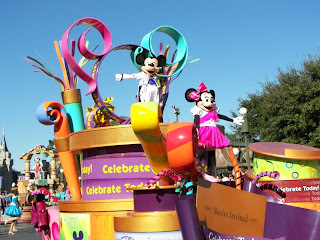 I love a parade! This one had all of my childhood heroes in one place and it was GREAT! The arrival of Mickey and Minnie was a really big deal. That night we returned to the park for the fireworks show. WOW - I've NEVER seen anything like it! 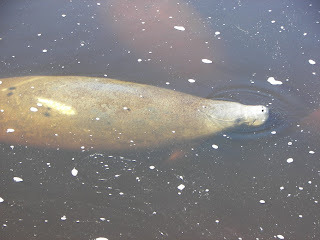 We wanted this trip to be more than Disney for Zachary so we took him to Manatee Park to see the manatees. There were even more animals there than last time. 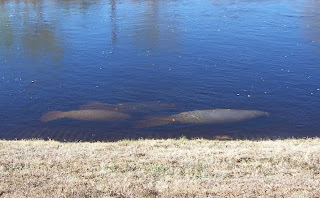 Manatees are mammals so they have to surface to breathe. 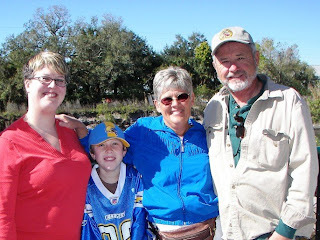 Laura, Zachary, Bill and me at Manatee Park. It was chilly early in the day. We also spent a wonderful day at Corkscrew Swamp. Cheryl is an avid birder so this day was for her (and me!) I'm not sure Zachary anticipated much fun - but by the end of the walk he announced that he was a birder! 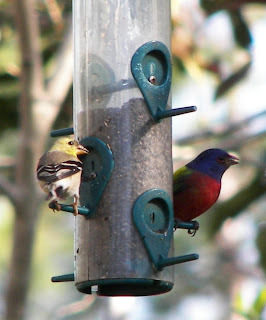 With Cheryl's help, we were able to identify many more birds than we had before. She can identify them by sight or sound, perching or flying. It was impressive. We also saw a family of raccoons and lots of alligators. They had a special program on the Wood Storks and one on alligators (with a cute baby). There are over 600 nesting pairs of Wood Storks at Corkscrew now and you could see them flying back and forth - bringing back food. Their foraging range is approximately 30 miles in every direction. The naturalist had a stork wing - and it was amazingly light. Everyone is celebrating the return of the Wood Stork and we hope the weather cooperates for a very successful breeding season for this endangered bird. 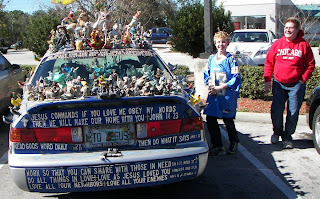 At one of our stops we parked next to this car. Every square inch was covered with something - refrigerator magnets, stickers, statues, painted verses - you name it. Check out the license plate. 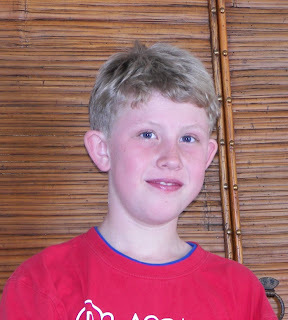 Zachary had to write a report about his trip for school. 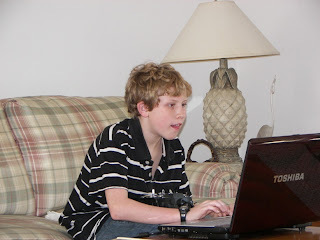 (Actually, I think he's playing Bill's flight simulator game in this picture) but the report got done. He wrote about his experiences day by day. I printed out lots of pictures and together we put together an album. The last line in his report read "...this is how old people live." 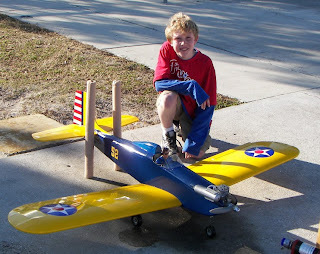 Bill took Zachary to Seahawk Park to see the planes fly. They had a great time and came home and convinced me that they had seen the endangered Burrowing Owls. I was excited - and ready to head back to Cape Coral right away - but Zachary had to finish his report. I tried to get Zachary to include them in his report - so he had to fess up and tell me it was just a joke. Bill also took Zachary with him to the barber and they both got haircuts. 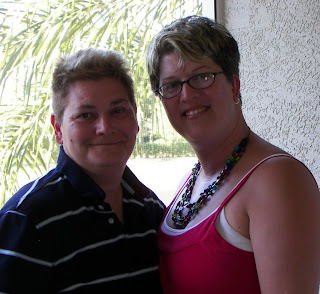 Just before we left for the airport, I got one last picture of Cheryl and Laura. I hope they all come back soon to visit. Great to see the family pictures and the beautiful birds!! Glad to hear you have another birder in the family!